Was founded in 1580 and eventually expanded to include cloisters, plazas, streets, tiled roofs, and cobblestone paving, this walled citadel served as total enclosure convent for nuns from the city's most distinguished families. 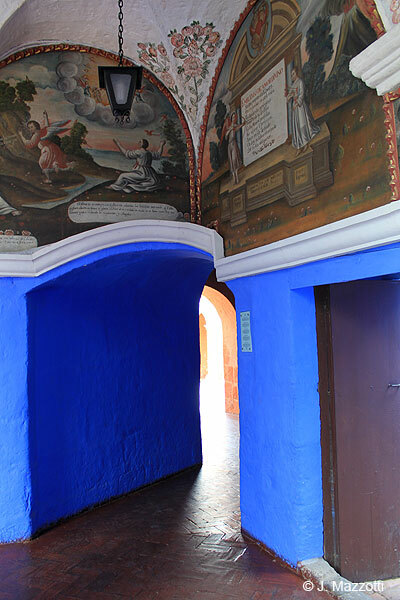 The town's interior hosts valuable colonial paintings of the Cusco School, carvings and figures, religious relics, and well preserved physical settings typical of the everyday life from more than four hundred years ago. It is one of the most fascinating colonial religious building in Peru, open to the visitors after 4 centuries in 1970. A paradise for photographers. Constructed to shelter the daughters of the wealthiest families of the city with a religious vocation, the monastery was inaugurated on October 2, 1580, under the name of Santa Catalina of Siena to be a totally cloistered religious center, and it remained that way until August 15, 1970. It occupies an approximate area of 20.000 m² (215.285 sq. feet), and its placement is similar to the first neighborhoods of Arequipa. The building exhibits rooms of very different architectural design. One of the areas has been established as a pinacoteca to display the canvasses of the Cusco School, Quito School and Arequipa School. There are other areas, or sectors, to visit as well, like the Gate Cloister, Silent Patio, Cloister of Novices, Orange-tree Cloister, Cloister of Saint Francis, etc. It was the place where lived the saint Sor Ana de los Angeles Monteagudo (1604-1686), beatified by Pope John Paul II during his visit to this monastery in 1985. 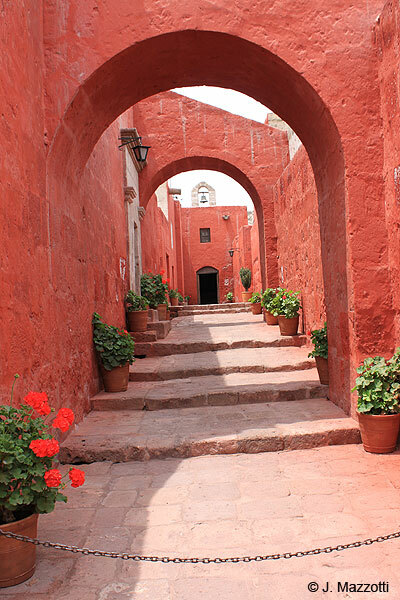 Location: Santa Catalina street N° 301, inside of Historical Center of Arequipa - Cultural World Heritage Site. Visiting Hours: Mon - Sun 9:00 am - 5:00 pm, Tuesdays and Thursdays 9:00 am - 8:00 pm. High Season - 8:00 am to 5:00 pm. The Monastery of Santa Catalina offers its visitors the independent guide service specializing in the languages English, French, German, Italian, Japanese, Portuguese and Spanish which are well trained and have years of experience in carrying out the tour of all the Monastery environments. Entrance paid. During his visit to Arequipa, Viceroy Francisco Toledo was informed by the Town Corporation about their wish, from years back, to found a monastery of nuns. He gave the necessary licenses to found the private monastery of nuns of the Order of Saint Catherine of Siena. Several years later, Doña María de Guzmán, the widow of Diego Hernández de Mendoza, a beautiful young lady who had no children, decided to retire into the yet unfinished monastery, giving to it all her fortune. On the 10th. of September 1579, the Memorial and Capitulation of the foundation of the Monastery was signed by the Town Corporation, the Judiciary, the Regiment of the City and the Bishopric of Cusco. The Town Corporation delivered the four plots owned by the city for its functioning and appointed Doña María de Guzmán as "the first to live within and be prioress of said Monastery". On Sunday 2nd. of October 1580 a high mass was celebrated in the city and Doña María was acknowledged as the founder and took the habits formally. The ladies who entered as nuns were Creole, half-bred and even daughters of curacas (Indian chieftains). In 1964 the first Spanish nuns entered. History tells of the intake of poor nuns and from ladies of the city, who without embracing the religious life entered into the Monastery to exert their virtues. In 1582, Arequipa suffered a severe earthquake and the Monastery was badly damaged. In spite of that, the retirement was kept. Then, a period of suffering started during which the nuns themselves repaired their rooms. Due to lack of money the chapel was not repaired and the "Holy Sacrament" was exposed in a hut made of straw. Santa Catalina was built in Arequipa, the city that was founded in 1540 in a place specially chosen for its natural beauty and good climate, and with a unique construction material: sillar, a porous stone from volcanic lava used to built a nice city with our own architectural designs, with spaces and proportions of great esthetic value, and also to have carvings on imposing fronts with fine decorative details, making of Arequipa a colonial center of marked identity, within the main urban centers of the continent. Its architectonic style is mainly colonial, but of a mestizo nature. Different from other colonial heritages in this part of Latin America, in Santa Catalina specially, the fusion of Spanish and native elements can be observed to the point of generating it own creativity. The recurrent earthquakes affecting Arequipa since 1582 destroyed the older constructions and also the properties of the relatives of the nuns of Santa Catalina over whom the income that guaranteed the future economy and life of the Monastery was dependent. This was the reason and origin for building the citadel whiting the monastery of Saint Catherine of Siena in Arequipa. The relatives of the nuns decided to built private cells for them, because the common dormitory was damaged and was also too small for the increasing number of nuns. For almost two centuries during the viceroyalty, the cloisters and cells of Santa Catalina have underwent modifications, additions and new constructions. All of these have made of it a sample of the colonial architecture of Arequipa. 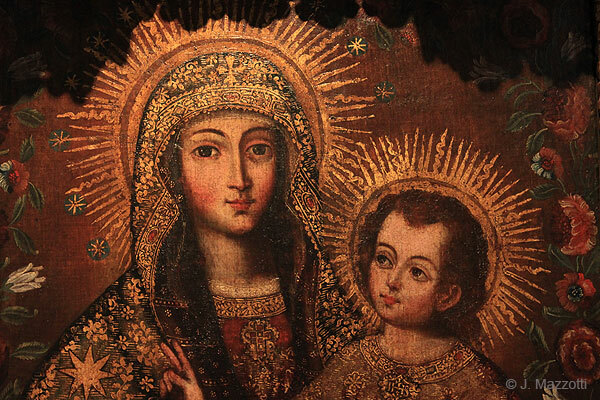 When the restoration work of the Monastery started, before its opening to the public, a great collection of pictures of mainly religious themes was found all over inside it, samples of Peruvian painting during the viceroyalty. About 400 pictures were restored or "refreshed" to make them recover their original aspect. The work of expert hands has recovered for present day observers a collection of great historic and artistic value. The main pictures are shown in a majestic stage: two immense rooms with high vaults, in the shape of a cross, from which the plaster has been removed showing the walls made of sillar. At the side there is another vault, a smaller one, completing the architectonic unity of the Museum. In the Picture Gallery we can see one of the most important exhibits of the religious art of the Continent. Besides, there is a numerous collection of paintings of the so-called Cusco School of Painting, the maximum expression of the blending of the feelings and values of two cultures: the Inca and the Spanish. The Indian artists from the XVI to the XVIII centuries achieved an extraordinary artistic ability in outstanding paintings of religious inspiration, made famous by the originality in their style, profundity of expression and the use of gold in its finishing. 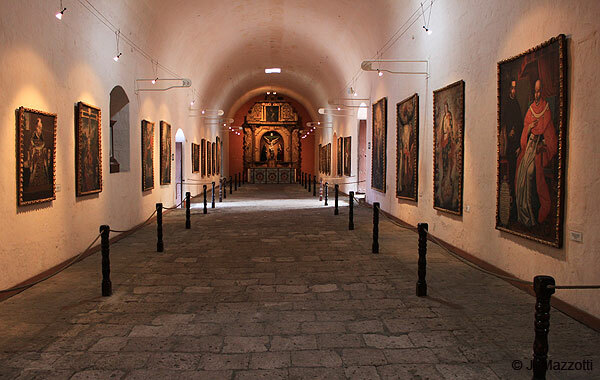 This monastery keeps pictures of diverse artistic styles, developed during viceroyalty and the beginning of the republic. There are paintings of the style that came from Italy in the early period: canvases with clear influence of the Spanish school, amount which a St. Michell the Archangel, of Zurbaran's influence stands out, and naturally, works of the so called Cusco school of painting, which was developed in Peru during the XVII and XVIII centuries.